Money Matters: Do I Have To Give? Money is a good gift of God. Even though it can be used for great evil and even though it always threatens to become an idol, money is good. Money is not the root of all evil; rather, the love of money is the root of all kinds of evil. This means that there is nothing wrong with earning it; there is nothing wrong with bringing home a paycheck. And, in fact, quite the opposite is true. The Lord expects that we will work hard, earn a fair wage and use our money responsibly. The way I would like to handle this is to give seven summary reasons—which I will try to show from Scripture—for why I pray my sons will all give the first 10% of their income to the work of Christ, and then grow beyond that as God prospers them. Tithing honors an Old Testament principle of how God provided for the ministers he called and the expenses of their ministry. You shall have no inheritance in their land, nor own any portion among them; I am your portion and your inheritance among the sons of Israel. And to the sons of Levi, behold, I have given all the tithe in Israel for an inheritance, in return for their service which they perform, the service of the tent of meeting. When we tithe today, we honor a principle found here. Some of God's people are called not to do moneymaking business in the ordinary ways. They are called to be pastors and ministers and missionaries and ministry assistants, and so on. The rest of God's people (call them "lay ministers") are to be gainfully employed and support the "vocational ministers"—and the costs of that ministry. In the Old Testament God laid down that this be done by tithe. Woe to you, scribes and Pharisees, hypocrites! For you tithe mint and dill and cumin, and have neglected the weightier provisions of the law: justice and mercy and faithfulness; but these are the things you should have done without neglecting the others. So Jesus endorses tithing: don't neglect it. It is not as essential as justice love and mercy; but it is to be done. In other words when we tithe today, we honor a principle and plan of God that sustained the ministry in the Old Testament and probably sustained the New Testament ministry as well. When we release a tenth of our income and give it over to the ministry and mission of Christ in the world, we honor the Creator rights of God who owns everything, including all our income. That is absolutely true. It's why my main way of talking about money year in and year out at Bethlehem is not to focus on tithing, but to focus on lifestyle. What you do with every cent says something about your view of God and what he means to you. And what your values are in this age. And what you think your few years on earth should be spent for. That's true. But God is wise and knows us deeply. He knows that there is something wrong with the husband who answers his wife's complaint that he doesn't give her any time by saying, "What do you mean, I don't give you my time? ALL my time is yours. I work all day long for you and the children." That has a very hollow ring to it if he doesn't give her any "especially time." Giving her some evenings together and some dates does not deny that all his time is for her, it proves it. This is why God declares one day in seven especially God's. They are all his, and making one special proves it. And this is the way it is with our money and God. Giving God a tenth of our income does not deny that all our money is God's, it proves that we believe it. Tithing is like a constant offering of the first fruits of the whole thing. The tenth is yours, O, Lord, in a special way, because all of it is yours in an ordinaryway. I believe the tithe should be the first check we write after the income deposit is made in the bank. And when you write it, you put a seal over what's left: GOD'S. The tithe reminds us of that, and proves that we really believe it. Giving away a tenth of our income to the mission and ministry of Christ is an antidote to covetousness. Let your character be free from the love of money, being content with what you have. Every time you give a tithe, you must deal with the desire for what you might have bought for yourself. To give is not to buy. And that weekly crisis is utterly important to maintain. We must fight covetousness almost every day. And God has appointed an antidote: giving. He tests us again and again: what do we desire most—the advancement of his name or 10% more security and comfort and fun? As Jesus says, You know where your heart is by where your treasure is. Tithing is one of God's great antidotes to covetousness. The fourth reason is almost the same as the last one, but not quite. When we go to the tithe and beyond, as I am suggesting we should, it puts a governor on ever-expanding spending. There is an almost infallible human rule: spending expands to fill the income. This is why you could have a book a few years ago entitled Getting By on $100,000 a Year. If you make more, you buy more, and the things you buy have to be stored and repaired and insured. Spending begets spending. If you have less at your disposal, you spend less. And most of the time you don't even think about it. I spend absolutely no time thinking about world cruises and $30,000 cars. But if I made two or three hundred thousand dollars a year, pretty soon things like that wouldn't seem any more strange to me than all the stuff I buy now—because I could afford it. If this is true—if expenses almost inevitably expand to fill the income—how shall we restrain ourselves from accumulating more and more stuff and more and more expensive stuff, and looking to the world like we have all the same values they do in our little earthly prelude to eternity? The answer is that as our income grows, we move beyond the tithe. We resolve to give a greater and greater percentage of our income to advance the kingdom. This puts the brakes on our natural impulse toward luxury. Take John Wesley for example. He was one of the great evangelists of the 18th Century, born in 1703. In 1731 he began to limit his expenses so that he would have more money to give to the poor. In the first year his income was 30 pounds and he found he could live on 28 and so gave away two. In the second year his income doubled but he held his expenses even, and so he had 32 pounds to give away (a comfortable year's income). In the third year his income jumped to 90 pounds and he gave away 62 pounds. In his long life Wesley's income advanced to as high as 1,400 pounds in a year. But he rarely let his expenses rise above 30 pounds. He said that he seldom had more than 100 pounds in his possession at a time. This so baffled the English Tax Commissioners that they investigated him in 1776 insisting that for a man of his income he must have silver dishes that he was not paying excise tax on. He wrote them, "I have two silver spoons at London and two at Bristol. This is all the plate I have at present, and I shall not buy any more while so many round me want bread." I cannot help leaving my books behind me whenever God calls me hence; but in every other respect, my own hands will be my executors. The last three reasons for moving to the tithe and beyond are all found in one text, 2 Corinthians 9:6–8. Let's read it and then point out the reasons briefly. Paul is talking about giving. Now this I say, he who sows sparingly shall also reap sparingly; and he who sows bountifully shall also reap bountifully. Let each one do just as he has purposed in his heart; not grudgingly or under compulsion; for God loves a cheerful giver. And God is able to make all grace abound to you, that always having all sufficiency in everything, you may have an abundance for every good deed. The fifth reason for going to the tithe and beyond in our giving is that this is God's way of bringing about many good deeds for his glory. At the end of verse 8 Paul says that when you sow bountifully and cheerfully, you will "have an abundance for every good deed." The goal is good deeds. Excess money is for good deeds. These are the things that make your light shine and cause people to give glory to your Father in heaven. If you lay up treasures on earth, people have no reason to think your Father in heaven is glorious. You look like you love what everyone else loves. According to Titus 2:13 Christ died "to purify for himself a people who are zealous for good deeds." 2 Corinthians 9:8 says that the aim of material bounty is "for every good deed." Verse 11 says, "You will be enriched in everything for all liberality." Excess money is given to us so we can show where our treasure is by giving it away. 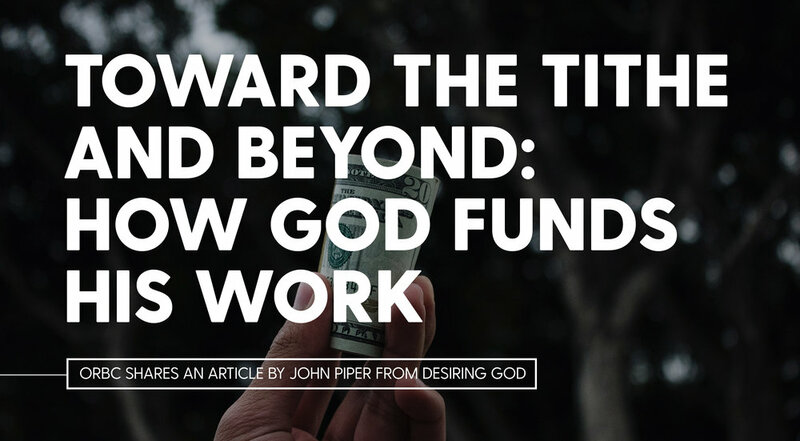 So the fifth reason for going to the tithe and bountifully beyond is that this is God's way of providing for many good deeds. The sixth reason for pressing to the tithe and beyond is that it is God's way of providing you, the tither, sufficient money for your needs. Giving is a way of having what you need. Giving in a regular, disciplined, generous way—up to and beyond the tithe—is simply good sense in view of the promises of God. Verse 6 says, "He who sows bountifully shall also reap bountifully." Then verse 8 says, "God is able to make all grace abound to you that always having all sufficiency . . . " In other words the "bountiful reaping" promised in verse 6 is explained in verse 8 by God's pledge to give a sufficiency for us and an abundance for good deeds. Bring the whole tithe into the storehouse, so that there may be food in My house, and test Me now in this, says the LORD of hosts, if I will not open for you the windows of heaven, and pour out for you a blessing until it overflows. Give, and it will be given to you; good measure, pressed down, shaken together, running over, they will pour into your lap. This is not a guarantee of getting rich. It's a guarantee of "an abundance for every good work" and sufficiency for yourself. Finally, in our giving we should press toward the tithe and beyond because it will prove and strengthen our faith in God promises. Let your character be free from the love of money, being content with what you have; [why? because of a promise] for He Himself has said, "I will never desert you, nor will I ever forsake you." Every time you doubt that you can live on 90% of your income, let the glorious promise of God strengthen your faith: "My God shall supply all your needs according to His riches in glory in Christ Jesus" (Philippians 4:19). So you can see why I care so much about my sons and whether they are remembering the rock from which they were hewn. Because what tithing boils down to is a faith issue. Do we trust God's promises? I appeal to you, my sons. I appeal to you, my people. Trust God. He will never fail or forsake you. He will supply all your needs.